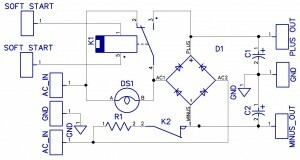 Is it at all possible to build a Three-In-One triple treat for the filter capacitors: a soft start, a rapid discharge, and a status display, and all this by using only but SIX additional elements within the circuit, and all this aforementioned, in full conformance to the KISS Principle ? Like in: “Keep It Simple and Stupid” ? Time and again, I am fed up with the long waiting time, whilst waiting for powering up my OTL, or rather with the long, “fixed duration” RC time constant associated with “triggering” the bypass relays. Whatever value I chose for this time constant, it was always related to the value of the FIXED resistance that was supposed to suppress the surge current, whilst loading the capacitor bank. 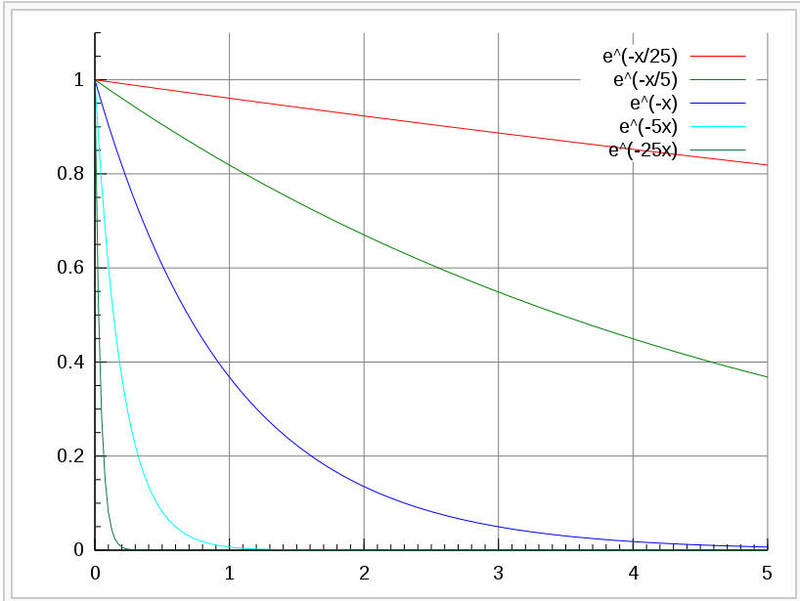 But the thing is, … the surge current is a a curve of the type 1 – e^(t/Tau), the so called “exponential decay” curve, in which the initial peak current is very short in duration, and then rapidly diminishes. This is the “logic” of loading up a capacitor bank. 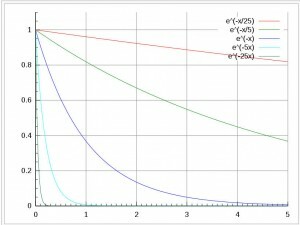 The logic of the surge current value. As soon as the initial “SURGE” hits the capacitors, they start to gradually gain in charge and in voltage. But as the charge and voltage of the capacitor increases, at the same time the difference in potentials between the rectifier bridge and the capacitor bank decreases. And the less “outstanding”, or “missing” charge or voltage there is to be “filled up” for. Similarly, the associated loading current is getting gradually SMALLER, and SMAller, and smaller, and smaller. a). 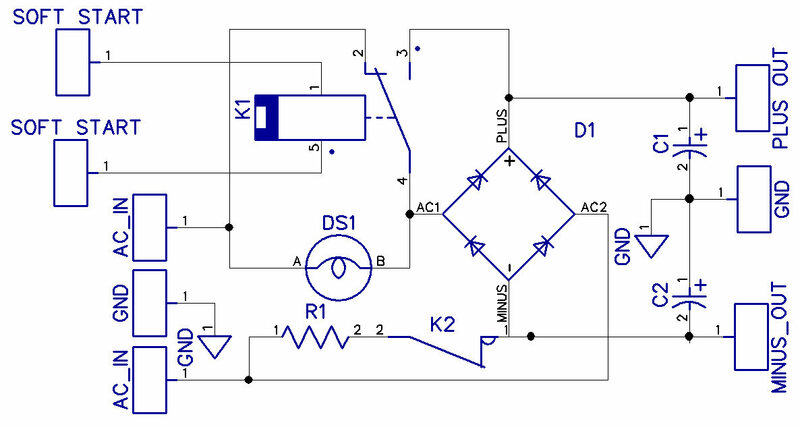 Initially, a resistor of a very HIGH resistance, for as long as the current surge is high, and the “missing” charge / voltage on the capacitor bank is significant. b). After a while, the resistor should gradually DECREASE it’s resistance, to speed up the charging process, up to a state of readiness. The decrease in resistance would be a logical countermeasure to the decreasing value of the surge current value, as it expotentially decreases in time. I have found such a resistor. It is called a miniature G9 halogen light bulb, with an operating voltage of 230V, and a power rating equal to 18W, 25W, 30W, 40W, or 60W respectively, depending on the power consumption and the specific requirements of the device that you are building. A halogen bulb filament has a high resistance, when there is a high current flowing through it, i.e. when it glows slightly. At the same time, the filament rapidly adjusts and LOOSES this high resistance, as soon as it cools off, as a result of the decreasing value of the current that is flowing. The halogen bulb is an ultra exaggerated POSITIVE TEMPERATURE COEFFICIENT type of device. Exactly the kind of “intelligent resistor”, that we were looking for. This circuit has only but THREE additional elements, apart from the “normal” bridge rectifier, that would normally be expected in such a context. The circuit boasts a “three-in-one” functionality. a). 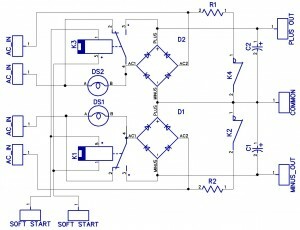 It controls the surge current that charges up the capacitor bank behind the rectifier bridge. The current, initially flowing through the 230V/25W halogen bulb, is intelligently “limited” by the varying resistance of the halogen bulb. During the “initial” surge, the bulb flashes up heartedly and exposes a significant value of resistance during this moment. As the surge subsides and the capacitor bank gains some voltage on its terminals, the current subsides. But at this moment – so does the resistance of the halogen bulb, which stops glowing and now represents a much lower serial resistance. Such a “varying” value of its resistance allows us to significantly speed up the waiting time, up to the moment of a fully charged capacitor bank and device readiness. b). The circuit provides for a rapid discharge of the capacitor bank, as soon as you switch the device OFF. The discharging current route is accomplished via the “NC” – Normally Closed Connectors of the Relay, via which the positive charge from the capacitors is routed via the halogen bulb, via the transformer winding, and then back to the negative terminal of the capacitor bank, via the appropriate second set of “NC” relay contacts. c). The actual color, or emission of light, by the halogen bulb, can be considered as a visual monitoring status of the power-up, or power-down sequences. 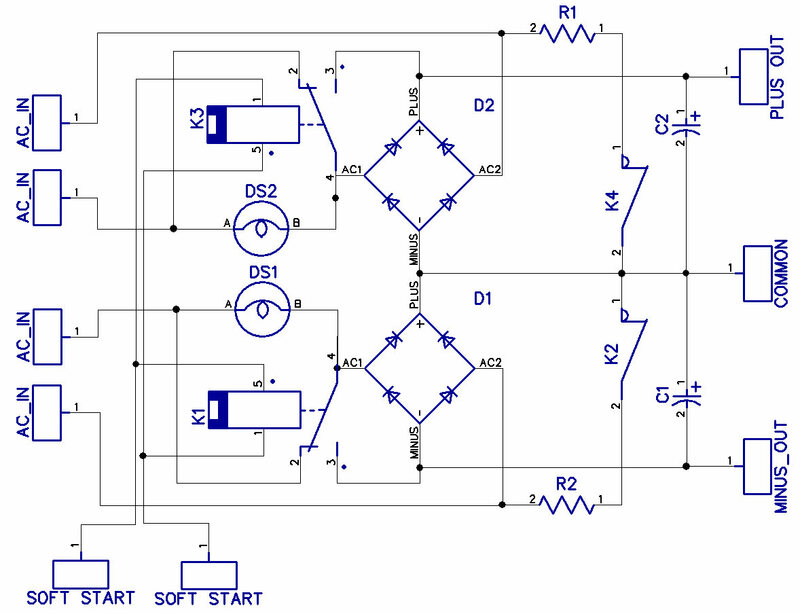 Although this circuit has been built up by means of a double path relay, with two independent sets of anker, NC, and NO terminals, you may wish to consider two separate and independent relays, powered from the same SOFT-START control logic. The reason for considering two independent single-path relays is that such relays tend to be available in much more robust contacts, capable of withstanding up to 16 Amperes of current or even more. If your device under construction is a current hog, you well may be forced to use such two independent, high current capable relays, instead of a single unit with two independent switching paths. How do we go about “sizing” the power of the halogen bulbs ? Easy. 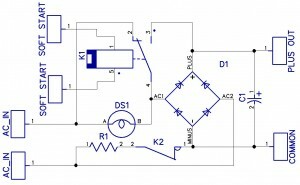 Your amplifier DC rails are probably in th 20V do 40V DC region. A 230V AC halogen bulb will enjoy a long and unstressed life under such voltage conditions. As for the “resistance” that you shall be targeting, keep in mind, that the best case (highest value) resistance of a, say, 230VAC/40W halogen bulb is 230 * 230 / 40 = 1322 ohms. But this is in the “VERY HOT” condition, when it is glowing, i.e. emitting light in full force. The “Cold” version of the same filament will be a few ohms or a few tens of ohms. The luke warm version of the same fillament will be most probably in the few hundreds of ohms region. So, having said all that – simply try them out and see which one fits you best. There is a whole range of choices, ranging: 18W, 20W, 25W, 33W, 40W, 50W … or even 60W. Anyways, after the soft start control circuitry is activated, afer an initial timer delay, the bulb shall be bypassed by the relay contacts, and will fall out of the circuit altogether. So in essence, it is no big deal. Just a question of how “fast” you want to charge those capacitors, without blowing the primary fuse from momentaneous overcurrent. So we have covered the topic of a single rail power supply. But … but almost all of the amplifiers that people are building out there are based on a symmetrical power supply, with two separate power feed lines, the positive and negative lines, with respect to ground. In case you are one of them, and have purchased a special toroidal transformer for the task of powering up your beast, you have most probably purchased it with two independent AC windings, for each of the power lines. The soft start control lines have been integrated so as to concurrently control all of the available relays (i.e. 2 or 4, depending on your specific implementation choices). The concept is very much the same, but doubled up. WARNING: For this schematic to work properly, it is absolutely essential that the AC input lines are fed from TWO separate transformer windings. 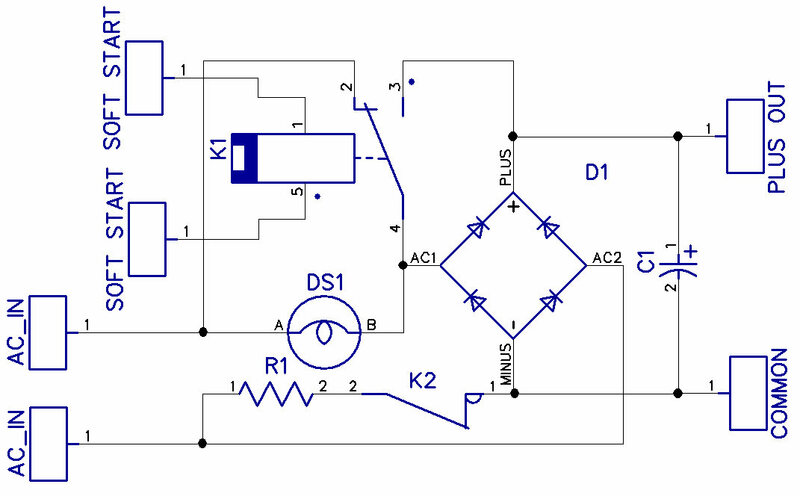 It is *** NOT *** possible to use this schematic with a transformer that is only but equipped with a center tap (… a typical E-I core based transformer will probably not be good for this application). The windings NEED to be independent of each other, as is the typical case in toroidal transformers. Non adherence to this advice shall result in a short ciruit via two series connected diodes, and the resulting destruction of 1 or 2 rectifier bridges, or maybe even the transfomer. P.S. … You may be wondering, how the hell the bridge rectifier is supposed to work properly within such circuits, when the “soft start” signal is not yet active, i.e. during the “slow charge-up” phase. Well, the simple answer is … that it doesn’t work at all. Not as a full bridge, at least. It does not work as a “Bridge”. It works as a “quarter” of a Bridge. As a single diode, to be specific. A diode that is connected in series with a halogen bulb and with the capacitor bank. But there is more to it: This only works during one of the two halves of the sine cycle. But that is “good enough”, to pull up the capacitors to reasonable pre-charged state, somewhere much closer to their final operating voltage, rather than the “hard floor” of the common line (at zero volts). For half of the sine cycle, we essentially have a single diode connected in series with the halogen bulb and the capacitor bank. All other elements are harmless, or fall out of the circuit. During the other half of the sine cycle, Nothing happens to the capacitor. It simply keeps its charge. There is a parallel path for the current, running through a diode and the bulb, or are rendered harmless, but that is not too painful, as the soft start will trigger soon and the whole circuit will transform to a “full bridge”, as we are normally used to it. This idea actually works. A mutation thereof, albeit with resistors, as opposed to this here newly introduced “halogen bulb”, already works in one of my amplifiers. No problems whatsoever.